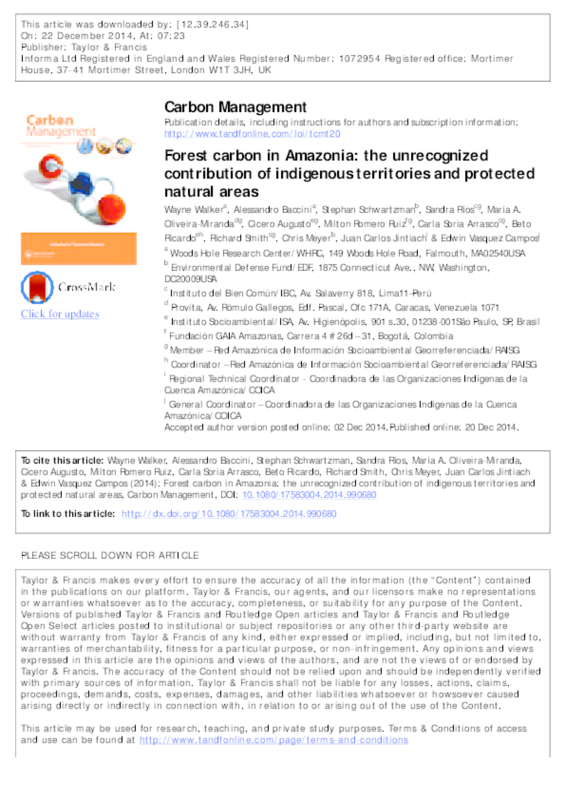 This study suggests that protecting the vast amount of carbon stored above ground in the forests of indigenous and protected lands -- totaling 55% of the Amazon -- is critical to the stability of the global climate as well as to the cultural identity of forest-dwelling peoples and the health of the ecosystems they inhabit. "We see, for example, that the territories of Amazonian indigenous peoples store almost a third of the region's aboveground carbon on just under a third of the land area," said Woods Hole Research Center (WHRC) scientist Wayne Walker. "That is more forest carbon than is contained in some of the most carbon-rich tropical countries including Indonesia and the Democratic Republic of the Congo." Yet the authors also find that nearly 20% of tropical forests across Amazonia are at risk from legal and illegal logging, construction of new roads and dams, and the expansion of commercial agriculture, mining, and petroleum industries, pressures which are exacerbated in many countries because governments have failed to recognize or enforce indigenous land rights.